Does having a college degree from a highly selective school make a difference in getting a well-paid job? Not if you're African-American, says a University of Michigan researcher. A popular belief in U.S. society is that education is the great equalizer to overcoming social disadvantages and obtaining a good job. In his study, S. Michael Gaddis tests the value of different types of college degrees in the labor market for white and black candidates. The results show that although a credential from an elite university results in more employer responses for all applicants, black candidates from these prestigious universities do only as well in getting the job as white candidates from less-selective universities. A white candidate with a degree from an elite university can expect an employer response for every six résumés submitted, while an equally qualified black candidate must submit eight résumés to receive a response. White candidates with a degree from a less-selective university need to submit nine résumés to expect a response, while a similar black candidate needs to submit 15 résumés. "These racial differences suggest that a bachelor's degree, even one from an elite institution, cannot fully counteract the importance of race in the labor market," said Gaddis, a postdoctoral scholar in the Robert Wood Johnson Foundation's Health Policy Scholars program at the U-M School of Public Health. "Thus, both discrimination and differences in human capital contribute to racial economic inequality." Gaddis used a unique field experiment to test the value of different types of college degrees in the labor market for white and black candidates. He created more than 1,000 fake job applicants through email addresses, phone numbers and résumés, and applied to jobs online. Each candidate listed a degree from either an elite school (Harvard, Stanford, Duke) or a nationally ranked, but less-selective state university (University of Massachusetts-Amherst, University of California-Riverside, University of North Carolina-Greensboro). Additionally, the candidates had first names that likely identified their race: Jalen, Lamar and DaQuan (black/male); Nia, Ebony, and Shanice (black/female); Caleb, Charlie and Ronny (white/male); and Aubrey, Erica and Lesly (white/female). White job applicants with a degree from an elite university had the highest response rate (nearly 18 percent), followed by black candidates with a degree from an elite university (13 percent) and white candidates with a degree from a less-selective university (more than 11 percent). Black job applicants with a degree from a less-selective university had the lowest response rate (less than 7 percent). "Education apparently has its limits because even a Harvard degree cannot make DaQuan as enticing as Charlie to employers," Gaddis said. He also says that race results in a double penalty. When employers responded to black candidates, it was for jobs with lower starting salaries and lower prestige than those of white peers. Black applicants received responses for jobs with a listed salary about $3,000 less than white candidates. 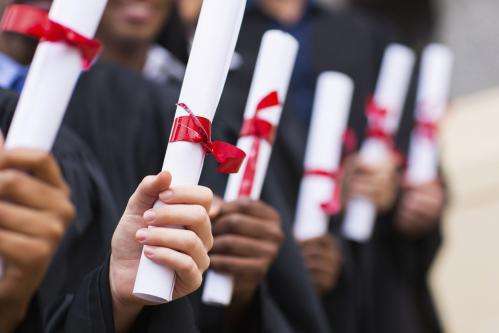 Overall, candidates with a degree from an elite university received responses for jobs with a listed salary $2,600 higher than applicants with a degree from a less-selective university, the study shows. "Gaddis ... created more than 1,000 fake job applicants". An alternative explanation to prejudice is that potential employees had a bias to do more checks on applications from people of color. This resulted in them preferentially finding that they were fake resulting in them been binned--thus the study tells us about biases in HR departments to check applicants not about whether they are prejudiced (which they may be or may not). Gaddis should have checked why applications were rejected to rule out a background check bias. not many firms / organizations have the resources to pre-screen at that level. Ususally the determination to do a background check comes after at least initial contact as the applicant could have found other employment opportunities, and the fact that it's ILLEGAL for a company that intends to hire to start a background check before receiving any consent. Perhaps there is a perception that some applicants did not have to meet the same standards or either admission or performance as others. There is also a possibility that some majors and courses taken are more equal than others. Much is made of Obama's 'elite' education, with few accomplishments at Harvard. Few mention Ted Cruz's Harvard education, with much accomplishment. Clarence Thomas graduated from Yale, but regrets the affirmative action as he is perceived as having earned it. The value of education is only return on the effort. Elite has no value. Even tough the Ivy League graduates some of the most stupid people in the world, they somehow end up working in high govt and legal jobs. Dyson's daughter attended Harvard and told him the Harvard education was not that important. It was the networking at Harvard that was the priority. Subjecting applications bearing "colored" names with extra background checks is still prejudice. It's unfashionable to be a racist these days. This forces them to go so deep in denial they will say something racist without realizing that it is racist, like squirrel just did. And then when someone points it out, they will vehemently deny it. Perhaps wherever they matriculate they could learn that if they swing on someone who is pointing a gun at them they are going to get shot. But hopefully that is something they would have learned a lot earlier. You would think eh?